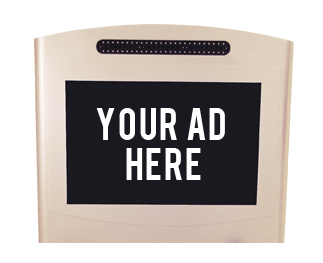 You can reach a whole new audience by advertising your product, service or share news right on a Veloxity cell phone charging station kiosk. Each charging station features a 19 inch LCD screen that offers a powerful advertising platform. Whether you have a video reel or static image advertisement, we can help you reach your audience at a tradeshow, mall, event, hotel, campus or anywhere. The attention grabbing charging station and screen display is a great way to reach and engage people 24/7. Are you planning an event or function? Our cell phone charging stations offer display sales opportunities for show management and can function as a valuable new amenity for attendees. Your customers and guests can see the advertisements or corporate messages when they charge their cell phones. Studies have shown that people exposed to on-screen advertisement on a cell phone charging station are 42% more likely to recall that specific advertisement vs other traditional forms of media advertisement. Would you like to advertise your product, service, brand, news or event on a Veloxity cell phone charging station? Reply below and will get in touch within a day.